Another kinda-of-tower-defence game comes to iOS that packs cool graphics, smooth gameplay and some pretty interesting sound effects. The game is called MonsterTower and its available for your iPhone device. I say that MonsterTower is kind-of a tower defence game simply because it doesn’t have the conventional tower defence look to it, and its instead split onto 3 different levels. 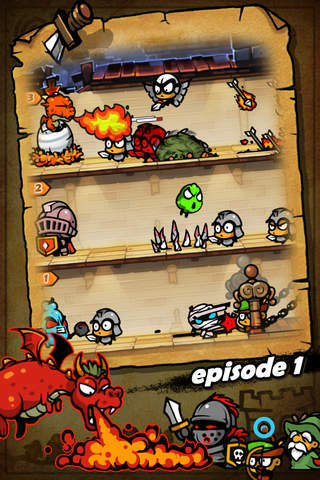 Monsters travel from the bottom right corner, and make their way up to your “tower”, which is actually an egg or a collection of eggs, in the top left. In the middle there is an empty “floor” to provide more ground for battle. Usually you will be playing as other monsters where the timer indicates the time intervals at which you can produce your monsters (stronger monsters cost more time but yield better combat skills) and the egg, along with the health status bar at the top, indicates health remaining. The objective of the game is rather simple, don’t let your egg get bashed in otherwise you won’t be able to hatch any more monster babies and that will be bad news for your monster family. So don’t do it. There’s plenty of tools along the way as well. You will unlock new traps, that allow you set temporary “attack mechanisms” that, well, attack your enemy, and upgrade your monster skills for improved battle performance. As you release your monsters by tapping their icon in the bottom left of the screen, they will walk out and begin their journey opposite to your enemy, to the bottom right of the screen. Any enemy they encounter, they will attempt to destroy, and once they reach the destination, will begin draining your enemies health bar. When that runs out, you win the level, upgrade your monsters, have a coffee and get back to doing some more of the same things. Except that its really addicting and you know that there’s more important things that you should be doing. But that’s besides the point. Overall, the game is very good and my only complaint isn’t exactly game related but its somewhat important. What I’m talking about is language localizations. I can’t speak for any other language other then English, but I can tell you that English localization is just absolutely terrible. The grammar is miles away from being remotely correct and most of the time I have no idea what the message is trying to say. Although this doesn’t inhibit gameplay necessarily, it can cause a steeper learning curve as you get to know the game. This is really the only downside that I’ve found. Check out MonsterTower for iPhone on the App Store!